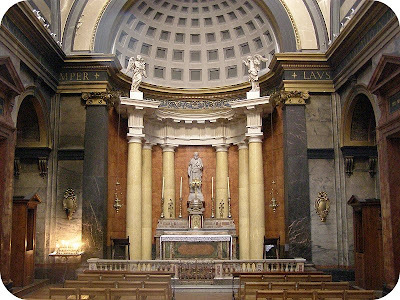 In recent years, the Oratory church in London has been notably enriched with several special architectural projects, thanks to specific benefactions from donors and particular legacies to the London Oratory Charity which the Oratory Fathers have applied in favour of our church and its maintenance. In 2005 the chapel of Saint Joseph was finally completed and re-ordered, with the construction of the present scagliola columns and stone architrave, and the scagliola apse. This was made possible thanks to a benefactor who wished to express his gratitude and devotion to St.Joseph. The cost was just on £250,000. No money was available for this project from the weekly offertory collections. 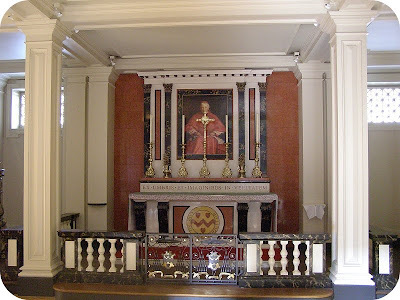 In 2010 a new chapel and altar were built under the organ loft, in honour of Blessed John Henry Newman, founder of the English Oratory, beatified by the Holy Father Pope Benedict in September 2010. The cost of building this chapel and altar was £160,000. Again, it would have been impossible to contemplate such a project simply on the basis of regular church income. Providentially, the Fathers had recently received a legacy from a departed parishioner who specified in her will that her legacy had to be spent on the Oratory church. This was a very welcome condition, and we were grateful to be able to devote a major part of that legacy to honouring Cardinal Newman, thanks to whom the Oratory was first brought to England, and who is generally recognized as the greatest English convert to Catholicism in the nineteenth century.